The CIC team have been working hard to create a high tech Boccia Ramp. Boccia is a ball sport, similar to bowls, for people with severe physical disabilities. The guys were challenged by a young man in Bristol who wanted to have more independence in the game. 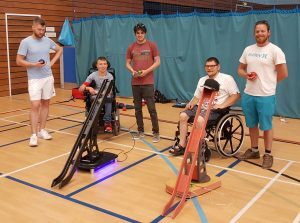 They took up the challenge and have created a ramp that will enable almost anyone to play, no matter the severity of their condition! 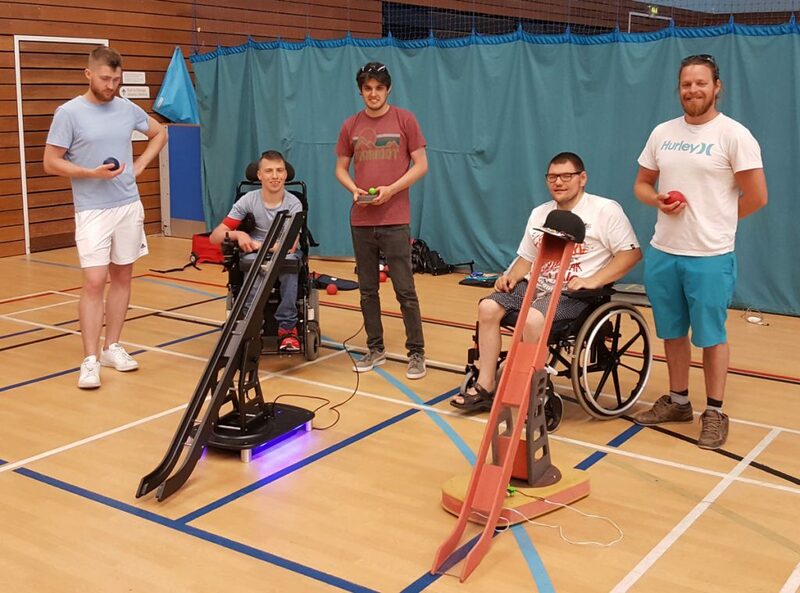 Almost any ability to move any part of your body will allow you to play Boccia with a lot more independence due to the unique electronics and controlling devices the team have made. Boccia players in the BC3 category ordinarily require an assistant to place the ball on the ramp at the required height, aim the ramp left and right according their directions and then they can launch the ball into play using a head pointer. Well now, the assistant merely has to pop the ball on the ramp, and using the super high tech controlling devices, the player can raise and lower the ball, aim left and right and shoot the ball. Whilst not being fully integrated with the rules and regulations just yet, the team are working with the amazing Paralympic Champion, World Champion, and joint most successful UK player ever, David Smith MBE, to perfect the design and technology to ensure that the Boccia ramp of the future is a smashing hit! Here are the design team’s Daniel Cuthbertson and Gerallt Devonald with David Smith and Richard Bachelor (Welsh Champion) who kindly gave up some of their training session to help us. Do you have a project for the team at CIC? If so, get in touch on [email protected] or 01792 783688.